Given how important it's been to our development, mankind will always be drawn to open flames. But if you're tired of buying tea light candles in bulk for a little bit of accent lighting, Fabien Gerlier's Caviar might be better suited to adding accent lighting to your home. Made of sintered bronze, the lamp stays lit without ever burning away. So what exactly is sintered bronze? Think of it kind of like a metallic styrofoam, but instead of being composed of thousands of tiny granules of foam, it's made of endless tiny specks of bronze. 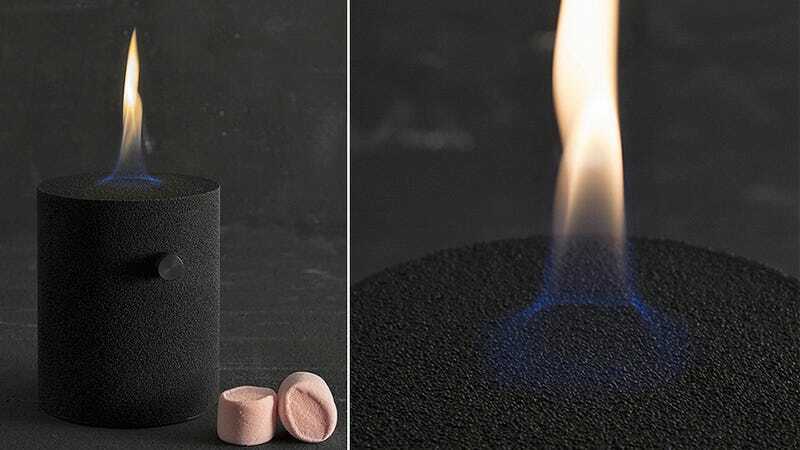 And since the material isn't solid, it allows gas from a fuel reservoir to seep through, and that's what's actually seen burning, not the lamp itself.